We can design our special purpose rivets for practically any type of application. At Universal Rivet, Inc., we understand that each project is unique. As part of the process, our knowledgeable staff will work with you one-on-one to understand your specific application requirements. We then draw on more than 35 years of experience to enhance your operation and value. By controlling each step of the manufacturing process, we are able to provide unparalleled insight into the engineering process. Our staff completely understands the importance of ensuring the right design and we will work tirelessly toward that goal. As a result, you can benefit from precision-engineered cold headed rivets designed specifically for your needs. When you need a quality custom-engineered rivet, you can depend on Universal Rivet, Inc. Contact us today to learn more about our custom rivet design services and how we can assist you. 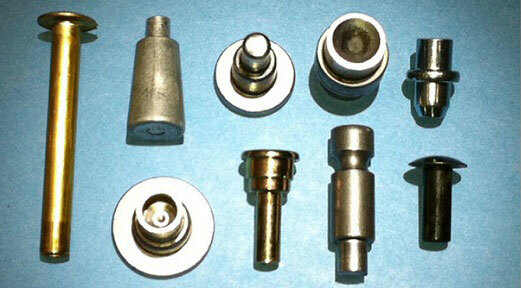 Universal Rivet can produce virtually any size and shape of rivet. Here are just some of the many styles that we produce regularly.